This was my first experience reading a book with alternating plots, based on a character's decisions. I found this concept to be really intriguing. As the reader, you're able to see how a story may unfold differently based on the choices that the character makes. This is something I often think about in my own life: if I had chosen option B, instead of A, how different would the outcome be? For Hannah, her path in life has an alternate route because of a decision she made one night while out with friends. The series of events that follow weave their way in different directions, yet eerily similar in other ways as well. Hannah has moved around from city to city after her parents moved to London during her formative years, leaving her without a home and always searching, longing for that belonging feeling. 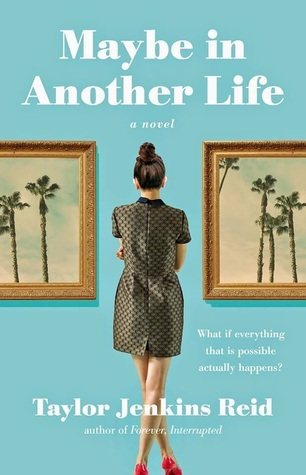 She finally decides to move back to L.A., where she grew up, borrowing a room in her best friend Gabby's house, until she gets her feet back on the ground. On her first night back in town, they get together with old friends, including Hannah's high school sweetheart, Ethan -- the one who got away and she has constantly wondered about. After a night of dancing, talking, laughing, and enjoying the company of one another she has a decision to make: stay at the bar with Ethan and see where the night takes them, or leave with Gabby who is her ride home. We see the story unfold from here as if she'd chosen both paths. Is fate determined by our choices? Or is it something left up to a higher being, lighting our paths as we go? Hannah questions this in both scenarios that are being told. In alternating chapters we see how Hannah navigates the consequences of her choices and everything that ensues as a result. I was never truly tied to one path over the other. I found myself interested in both, just as equally. It was the constant of Hannah's relationship with her best friend Gabby in both versions of the story that really pulled at my heart the most. And quite possibly the stand out star of the entire process. I recommend this book for fans of alternate endings, or for anyone who questions where we'd be if we'd chosen a different path. Overall I was very much interested in the storyline itself, and not so much with the characters. But sometimes, in the end, that's enough to equal a more than pleasant reading experience. Loved this one! Definitely not my favourite of TJR's (After I Do will be forever and ever) but this one was so fascinating with the dual timelines and one of the best i've read that did it. Have you read Forever, Interrupted as well? She does it really well there too I think! I think the femship in this book was absolutely brilliant and if Hannah and Gabby had just decided to live out their lives as single best friends who live and do everything together, i'm pretty sure I would have been so happy either way! I really love Taylor Jenkins Reid novels. They always manage to make me think! MAYBE IN ANOTHER LIFE is certainly no exception. I love that it challenged and expressed my feelings on fate and choice, and I really think it was handled well! So thrilled to see that you enjoyed this one as well.